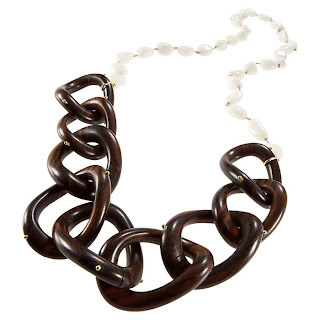 White quartz necklace with nine ebony links with 18K gold studs. Equally stunning when paired with t-shirt and jeans or an evening dress. Brown/White. Faceted black onyx small and large link necklace with braided 18K gold link. 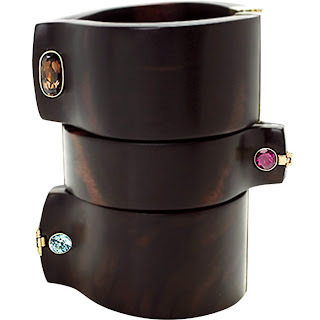 Classic shirtcuffs interpreted in smooth ebony wood complete with "cufflinks" in an unmatched duo of semi-precious gems set in 18K gold. With its cool, balanced blend of nature and contemporary design, this cuff is a shining example of the modern, feminine silhouette we're seeking this season. 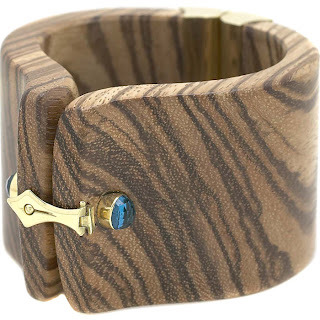 A single semi-precious blue topaz stone graces the 18K gold closure of this zebra wood cuff. 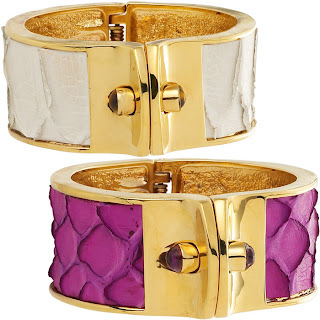 A subtle accessory with endless appeal, this cuff features unique hinge styling and understated elegance. A topography of stunning contrasts: Kara Ross's hinged cuff juxtaposes exotic python with lustrous tiger's eye and an 18K gold-plated clasp. 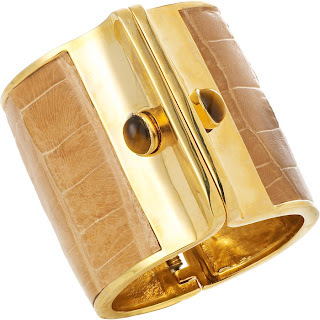 A topography of stunning contrasts: Kara Ross's hinged cuff combines the exotic brilliance of café-hued crocodile and lustrous tiger's eye with an 18K gold-plated clasp. 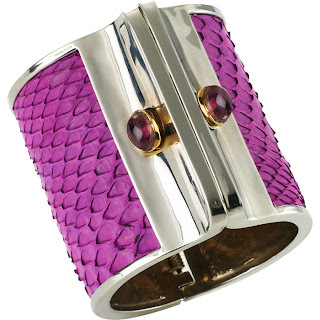 A topography of stunning contrasts: Kara Ross's hinged cuff combines the exotic brilliance of purple python, sparkling amethyst and a shiny rhodium clasp. Winter blooms with Kara Ross's luminous petal rings that sparkle like rare, enchanted specimens discovered under a glittering veneer of ice. 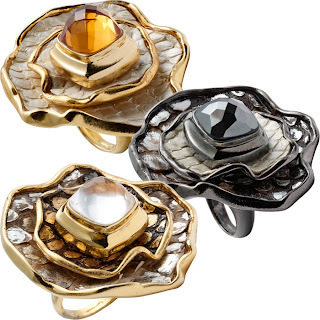 Two metallic-wash python petals surround a faceted central stone. Choose silver-washed brown python with rock crystal set in 18K gold-plated brass, white pearlized python and silver-washed brown python with hematite set in gunmetal, or white pearlized python with citrine set in 18K gold-plated brass.